A stylish blend of old world sparkle and modern clean lines, a princess cut diamond is endlessly versatile and sure to delight. These stunning shape diamonds are cut in a similar style to the round brilliant (they're sometimes referred to as a square modified brilliant) for a spectacular sparkle and gorgeous shape. Your Ada Diamond Concierge will help you design the perfect setting for your princess cut diamond to build the perfect ring for your happily ever after. Add a spectacular diamond band for a look as unique as your love. Classic solitaire styles, custom made for you with lab grown princess cut diamonds. Design a stunning custom eternity band to match any engagement ring. If clean angles and a sophisticated presence is what you desire, the popular princess cut is the diamond you're dreaming of. Princess cut diamonds are the most popular fancy shape, second in popularity only to the round brilliant. The princess cut is a relatively modern diamond cut, having first been developed in the 1960s. 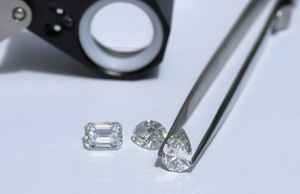 Ada Diamond Concierges specialize in hand selecting the best of the best of lab grown princess cut diamonds, working with every grower on earth to select diamonds for each client with the best fire and sparkle that are not made available anywhere else. Your diamond concierge will help you select the perfect diamond for your engagement ring, carefully curating a list based on your specifications and timeline. Inquire today to get started. According to Fortune, man-made diamonds are now better than mined, as cultured diamonds have objectively superior purity, strength, and sparkle compared to dirt diamonds.